Jack Baldwin has a worrying knee injury. 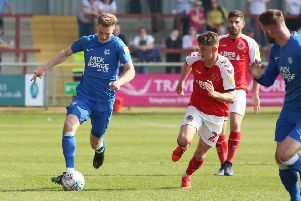 Posh manager Grant McCann revealed some worrying news about one of his star players at a press conference today (December 2). Jack Baldwin is struggling again with a knee injury - the same knee on which he had an operation in 2014 - and he faces an exploratory examination next week. Baldwin is suspended for Sunday’s FA Cup second round tie at Notts County but McCann said he wouldn’t have been involved anyway. “He’s struggling with his knee. It’s a fresh injury and it hasn’t settled down which is worrying,” said McCann. “He will almost certainly need an examination on it to see what the extent of the trouble is. Apart from the absence of Baldwin - and long-term injury victim Jermaine Anderson - McCann has a full-strength squad to choose from and that will definitely include Brad Inman. Inman had his first game back on Tuesday after breaking a leg in pre-season. That was for the reserves at Southend and he played for 70 minutes. “He’s still a week or two behind in terms of sharpness and still has a bit of a limp but he’ll defintely be in the squad,” said McCann. The manager said he hadn’t decided yet on how to fill the gap created by Baldwin’s suspension. He said he’d see how training went today before deciding on whether to play Michael Bostwick at centre-back or recall Ricardo Santos. McCann said he was expecting a tough game at Meadow Lane and was looking forward to it. “We’ve had some great battles there in the past and always seem to do well there. “It’s a big pitch which will suit our style of play and we’ll have a big fan base,” said McCann. “Notts County have some great individual players who can win the game but then so do we. It should be a great cup tie.